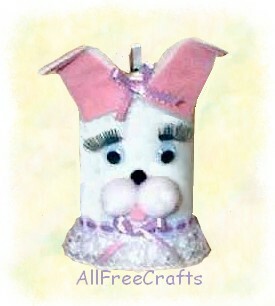 Here’s an Easter craft for kids – an Easter bunny bank to help them save extra money – recycled from an empty salt container! 1. Open the metal spout and lengthen the hole in the cardboard with scissors so that a large coin will fit. 2. Carefully remove the paper that wraps around the salt container. Try not to rip this paper cover because you will use it as a template. On white felt, trace around the paper rectangle or measure it and cut out a felt rectangle of the same size. 3. Cut two bunny ear shapes out of the white felt, then cut two slightly smaller ears from pink felt. Glue the smaller pink ears onto the larger white ears, then glue in place on the carton to create the bunny’s floppy ears. 4. Cut a plastic eyelash in half and glue on below the eyes. 5. Glue “goggle” eyes on below the eyelashes. 6. Glue the small brown pompom in place as the nose, then glue the two medium pompoms together and glue them in place below the nose. Next, glue on a small pink pompom under the two white pompoms as the bunny’s tongue. 7. For the collar, glue pre-gathered lace around the bottom of the container, as shown in the photo, with the hem of the lace flush with the bottom of the container. 8. Make two small bows from thin ribbon. Glue one in place in the center of the lace collar and one in the middle of the ears.